 Fantasy RPG with epic monsters & dragons! Fight, collect heroes & Battle in PvP! Battle dragons and monsters in DragonSoul, the epic fantasy RPG stuffed with amazing heroes, legendary monsters and fantastic loot! Battle online to earn legendary heroes and power-up to brawl your way through multiple fantasy game modes. Roleplay through the many Campaign chapters, test your skills against real DragonSoul players in PvP battles, and take a break from your quest to battle in the Boss Pit! Even team up with other players by joining a multiplayer Guild! With all new heroes, gear and maps to grind, DragonSoul is a ridiculously fun and epic role playing adventure! DragonSoul Features: Strategy RPG with Over-the-Top Battles! + Collect and choose your 5 best heroes to wage war against monsters, dragons and even other players online + Roleplaying games and campaign battles come with a ridiculously epic twist + Strategy is key to beating tougher and stronger opponents! Battle in Weekly ‘Guild Wars’ Fighting Games! + RPG fighting games give you a shot at squaring off against other players + Battle dragons and other amazing creatures in updated challenges + Multiplayer RPG games allow you to compete against other players for top ranks, prizes and bragging rights Epic Heroes & Powerful Runes! + Heroes have at least 4 deadly skills and 14 rarity levels + Collect Heroes to build the ultimate lineup + Battle with awesome gear like Laser Kittens, Enchanted Elbow Pads and Lucky Orc’s Foot + Legendary heroes get even stronger with the addition of Runes Battle Dragons & Legendary Monsters! + Battle dragons and monsters by fighting in combats + Monster RPG becomes real! Strategize with your heroes to battle your monsters in this RPG + Heroes clash with epic monsters in battles like you've never seen with unique & awesome gear Epic Hero Quest! + Battle dragons and monsters as you collect Soulstones to free and unlock Heroes from the clutches of the evil dragon, Umlaut! 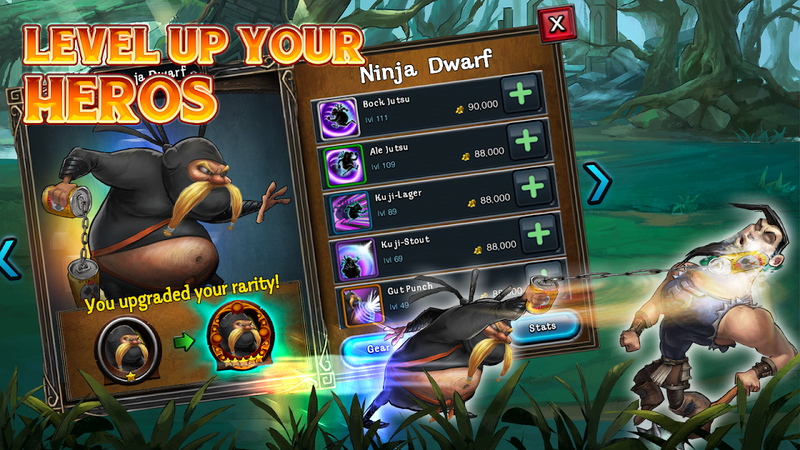 + Roleplaying as five main heroes; you’ll battle dragons and grab rare loot Amazing Graphics! + Explore a rich fantasy world filled with gorgeous environments, hilarious characters, astounding effects, and stunning graphics. Long ago, fearless heroes ruled the land with mighty powers. Then the jealous dragon Umlaut captured the heroes, trapping them in Soulstones. Now, only few heroes remain. Only YOU can take the remaining few on a journey from a scrappy band and turn it into an unstoppable army as you unlock Soulstones in each battle. Explore an original world with fantastic characters while fighting your way to the top, freeing heroes and defeating evil along the way! Fantasy RPG games will never be the same! 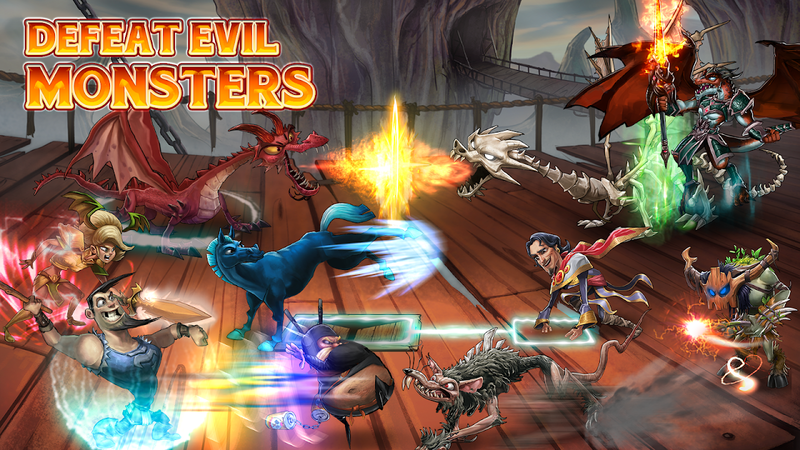 Battle with your legendary heroes and become the best in this monster RPG! Download DragonSoul today! DragonSoul is available in multiple languages, including: Spanish, French, German, Russian, Italian, Turkish, Portuguese, Dutch, Danish, Japanese, Korean, Chinese and Indonesian.  Is DragonSoul - Online RPG yours? Claim it!